Ganoderma root rot is a damaging fungal infection that may take hold of your oak trees, leading to decline and possible tree loss. As there is no recommended chemical treatment for this disease, provide optimal care as a means of prevention. Get to know cultural treatment methods in case of infection to maintain a healthy home landscape. Treatment for ganoderma root rot on oak trees is limited to cultural care since there is no registered fungicide. Practicing consistent maintenance will result in vigorous trees capable of resisting or fighting off invading fungal pathogens. Grow your oak trees in full sun to partial shade for best results, according to the Clemson University Extension. Most oaks thrive in moist, well-draining, acid soil; always determine the specific needs of the particular species or variety in your landscape. Ganoderma root rot affects all species of oak trees. This fungal infection is caused by the fungal pathogen Ganoderma lucidum, according to the University of California IPM Online. Stressed trees suffering from poor conditions like drought or physical injury are at a greater risk of infection. Pathogens are soil-borne, where they invade tree roots. Transmission can occur from an infected tree to a healthy one if roots make contact, according to the University of Arizona Extension Plant Pathology. Ganoderma root rot of oak trees results in the presence of fruiting bodies, or fungal growths, on the base of the trunk near the soil line. These shelf-like growths, referred to as conks, are reddish brown in color and measure up to 14 inches in width, according to the University of California IPM Online. As this above-ground symptom grows, the roots of the tree decay, as does the wood within the trunk. 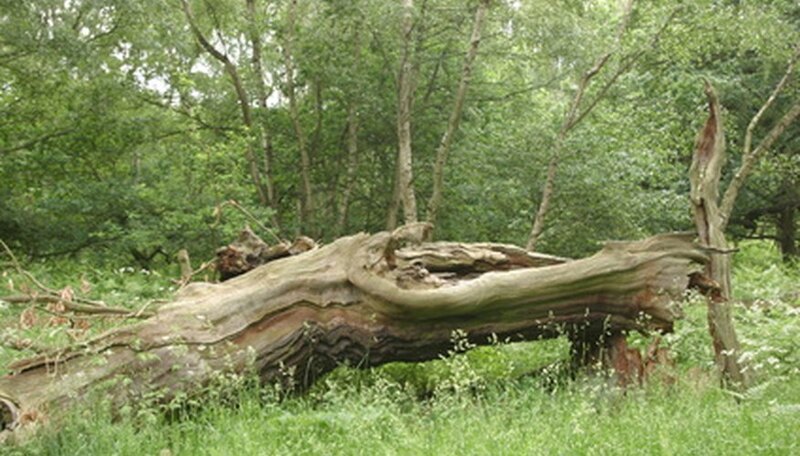 If treatment is neglected, trees may suffer from severe internal decay and die within three to five years. With the potential for transfer from tree to tree, be mindful of your home landscape selections. The treatment of one tree is a challenge, but a landscape full of infected trees will create a nearly unmanageable situation. Other highly susceptible host trees to avoid include, but are not limited to, acacias, ashes, boxwoods, honey locusts, poplars and willows, according to the University of California IPM Online. Treatment for ganoderma root rot for oak trees is limited to good care and prevention. Injury caused by any type of abrasion to the tree's trunk or roots leaves the oak tree highly vulnerable to infection. Practice caution when mowing or using other mechanical equipment near the tree, according to the University of Arizona Extension Plant Pathology. Remove and destroy dead limbs to prevent diminished health, pest infestations or other infections that affect tree health and lower resistance to root rot. Due to the interior decay of oak trees under ganoderma root rot infection, trees pose a threat to nearby structures, people and wildlife because collapse may occur suddenly. The only treatment for severely affected trees is removal; do not replant another oak or susceptible tree.